Colonization and industrialization are looking damn good in this early gameplay look at Anno 1800. With the seventh main installment of the series, Anno 1800 is going back to its colonial roots, while maintaining the production themes of its more futuristic endeavors. Once more, the game revolves heavily on industrialization and finding the balance between cost and resources, while also sprinkling in a few new features. It may require some dedication, but there’s a rewarding time at the end of that rainbow. 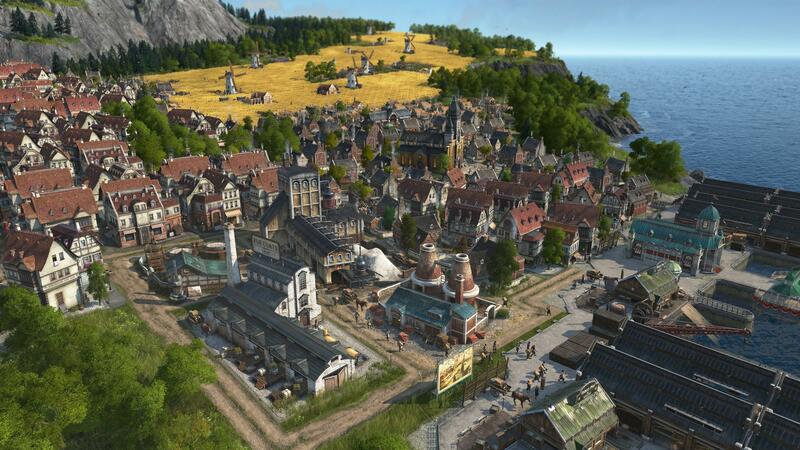 Anno 1800 starts off as ever before, with a small patch of land, a port and a ship, ready to take the islands by storm. The goal is to expand a network of citizens that each do their own labor, while collecting goods. As always, an isometric view looks over the houses, farms and shops of the island, with tons of detail when zoomed all the way in. An initial load time can take a while, but after that it’s smooth sailing, performance-wise. Visuals lean on the cartoonish side, particularly for character models, such as competitors and pirates. 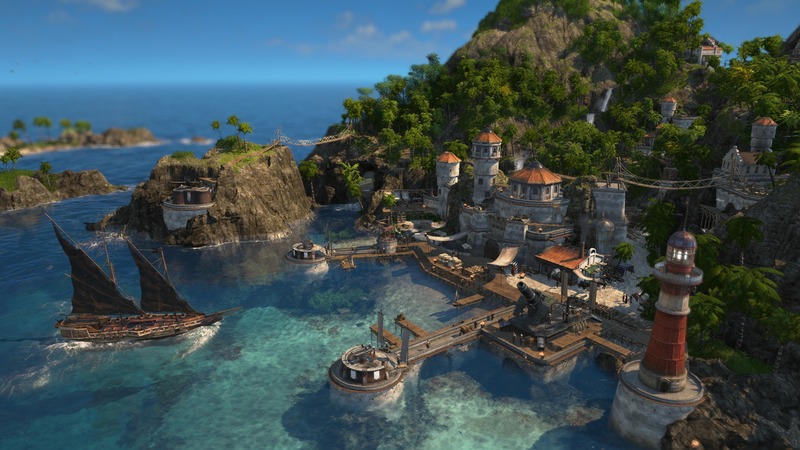 Anno 1800 manages to create an adventurous atmosphere, with all its tinkling bells and whistles, though a few voice lines can become excessively repetitive. In this iteration of the management simulation game, each tier of citizen is responsible for its own workforce. A general populace starts off as farmers, but can upgrade to a worker, an artisan and so on. The conceit is in trying to balance expansion, like spinning plates. Upgrade too many houses from one tier and suddenly lower buildings will lack employees. Trying to expand too quickly, on the other hand, will sink resources and budgets alike. At the same time, the island also needs to stay attractive enough for people to even want to be on board and come pay taxes. Population will take over the glut of space required, which is a clever adaptation, as it makes for a more realistic looking settlement; one with whole, vivid neighborhoods. Diplomacy with other islands isn’t as necessarily easygoing either, as trading ports will remain closed until enough favor is won, usually through a series of quests. Even so, warehouses don’t necessarily stock a lot of items, as each settlement only has a few fertility options and no one island can just produce everything. Need beer? Well, there might be grain to be had, but not hop. Some greasing of a neighbor, however, might open up a route to the necessary elements. Even flattery could work, if it leads to trade rights. To solidify versatility, manufacturing goods will require increasingly more branched steps, from farm to table as it were. Instead of having a simple line from one building to a tradable output, more complex items will require three or four different steps, each with its own workforce. So, getting to stock guns can take up several hundred workers, to have one unit end up in the warehouse. More employees once more means more houses and so on. Anno 1800 puts its hands in many different pots all at the same time, to the point that it can be a bit much. While trying to manage the general populace, quests will also require trading or sailing. Sometimes, production needs to be hurried to be able to beat the timer. At the same time, ships can be summoned to go on expeditions, which require extensive time and resources and come with a list of events that can easily turn sour. At the end of that expedition, new environments can be unlocked with rarer fertility attached. Those new islands, however, will need their own management loops. Making things more perilous, ships can be attacked by pirates during trips, unless rerouted. There’s also a newspaper element, which can have positive boons, but only if certain conditions are met. That last part, however, can be salvaged by influencing the results with propaganda. A fire or riot could break out at any point as well, which demands immediate attention. The point is that there are a dozen things going off at once and it is tough to handle. Yes, there’s a mountain of possibility in the sim game and it’s rewarding to see a civilization prosper, but it is a daunting task to manage. Trying to become a mogul is a worthy time sink, but there are a few points where Anno 1800 could do better. In particular, the complexity of the game is double-sided, as there is currently too little information to onboard newcomers. For instance, prompting quests and diplomacy as a whole is never addressed while being a crucial point of progress. Some quests require looking around for an item that isn’t properly explained. Even just building new settlements is vague and since that’s integral to getting exotic goods, it shows an acute lack of a compendium, to look up the pinpointed elements the game offers. It’s going to take quite some time to get to know the ins and outs of these colonial times. In the preview build, which is based on a beta build where balancing and performance isn’t final, there was also the first chapter of a more guided campaign. This story tells the tale of a bickering family of nobles; one strong and wealthy and the other cast out and destitute. That segment doubles up as a way to get familiar with some newer elements in the game and even hints at a few decision-based missions. In the final version, there will be an additional multiplayer mode that can have up to four players. There’s a ton to explore in Anno 1800 and that’s primarily a big plus. The game looks like same old Anno, but it takes what it has learned throughout the series with it, even offering a few new systems to bolster new depths. Things are looking up for this seventh main release, though it may want to think about padding out an explanation here and there, to go along with all these fancy trinkets it throws at players. With every lesson learned, however, there is growth. And there’s a lot of growth to be had here. Anno 1800 will release on PC on April 16, 2019. Please note that this is a delay from the originally intended date of February 26th. A Closed Beta will start next week on January 31st.